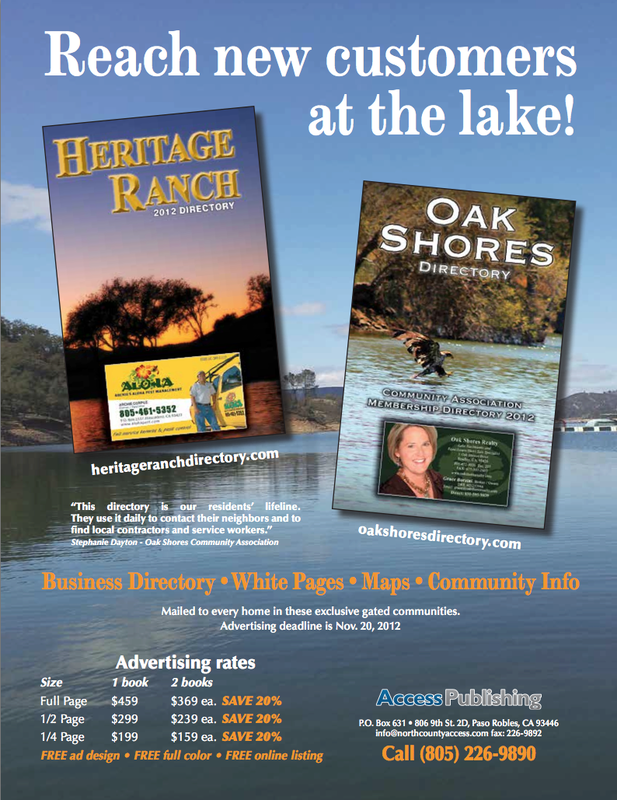 Access Publishing is starting work on two niche business directories serving the exclusive, gated communities of Heritage Ranch and Oak Shores at Lake Nacimiento, CA. The Heritage Ranch Directory and Oak Shores Directory both include a business directory, white page listings of residents, maps and important community information. The annual books connect residents to businesses who offer services in this North San Luis Obispo and Monterey County areas. The local directories provide a convenient list of those businesses willing to travel there, because these two resort communities are 30-to-60-minutes away from Paso Robles. The local guides feature beautiful photographs of scenes from Lake Nacimiento on their attractive glossy covers. At 5-inches wide and 8-inches tall, they are a small and convenient size. Advertising rates are very affordable to encourage Paso Robles businesses to promote themselves to the lakeside communities. ╥It╒s an excellent part of any Paso Robles business marketing plan,╙ says Brennan. Advertising information: Full page – $459, Half page – $299, Quarter page – $199. A 20% discount is available for advertising in both directories. Free design, full color, and a free online business listing are included in the advertising package. A convenient 3-month payment plan is available with a credit or debit auto-pay agreement. Deadline for advertising is Nov. 20, 2012. Publication date for the directories is Jan. 1, 2013. Distribution of more than 3,500 printed directories is by US mail to every resident in the area. Additionally, the books are available at the community association offices. A selection of advertisers in the last edition include: A Mobile Notary by Sally, American West Tire Pros, Archie’s Aloha Pest Control, Auto Limits Auto Repair, Callie L Fisher Insurance Services Inc, Country Florist, Country Real Estate Carolyn Potts, Frontier Floors, Lazer Star, North County Carpet and Upholstery Cleaners, Oak Hill Market, Oak Shores Realty-Grace Borzini, Paso Robles Heating and Air, Ray M. Buban, EA Financial & Tax Service, The Mobile Oil Changers, and The Tree Man. Access Publishing provides local business marketing solutions. It is a local leader in online marketing, Internet advertising, local search engine optimization, SEO, SEM, web design, writing and graphic design. The Paso Robles-based business, owned by Scott and Beth Brennan, has 10 creative and hardworking employees. The company’s publications include the San Luis Obispo County Visitors Guide, North County Access, Central Coast Active, Your Cambria Phone Book, Templeton Chamber Guide, Heritage Ranch Directory, and the Oak Shores Directory. Access Publishing serves Paso Robles, Atascadero, Templeton, San Luis Obispo, Grover Beach, Pismo Beach, Shell Beach, Avila Beach, Oceano, Arroyo Grande, Nipomo, Morro Bay, Los Osos, Cambria, Cayucos, San Simeon, Creston, Heritage Ranch, Oak Shores, Santa Margarita, and San Miguel. By Scott Brennan. Connect on Google+. Access Publishing, 806 9th Street #2D, Paso Robles, CA 93446, (805) 226-9890.